Sneakers are a must! Not just as a trendy shoe for any purpose, but also in the form of a Ravensburger 3D Storage Puzzle! The “American Style Sneaker” is a cool accessory for any desk or bedroom. 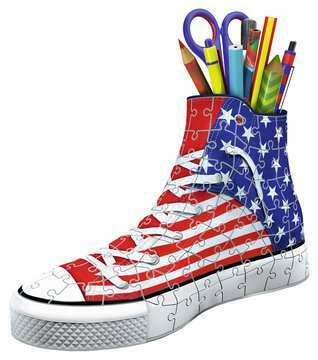 If you are looking for a practical storage option for the miscellaneous items scattered around a children’s room, this 3D puzzle sneaker is just the thing. With a casual design and patriotic colors; the sneaker is a must for everyone who is looking for a unique accessory. Thanks to Easyclick Technology, the pieces fit perfectly and are sturdy without adhesive. Can be puzzled by the image or by numbers. The practical inlay allows the sneaker to serve as a “cup” to provide storage for pens, rulers, filers, and all things that look best stowed away. 11" x 7.5" x 2.75"
8.5" x 3" x 5"